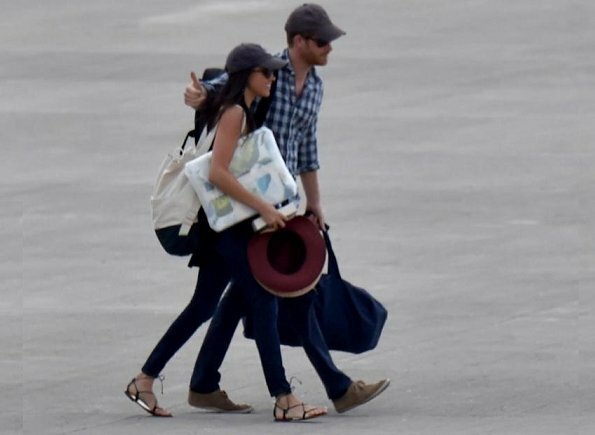 Yesterday, Prince Harry of England and his girlfriend Meghan Markle went to Africa for African safari and Meghan's 36th birthday. There are claims that Harry could be planning to propose to Markle (According to newspaper The Sun). (Africa holds a special place in the hearts of the British royals. Harry’s brother, Prince William, asked Kate Middleton to marry him there in 2010 as they stayed in a log cabin in Kenya). A royal source said: “Harry has been planning this holiday for a long time." The tabloids are saying that a marriage proposal is imminent. If it is, it will not go down well with the British public. The royal public relations team will have to work pretty hard to make Ms Markle look more Royal and less celebrity. They will be just fine. Miss Markle has made it easy for them as she is well spoken, knows how to handle the press, and is already involved in charitable efforts. Can't wait for a Duchess Meghan! I am British and have seen no evidence that an engagement would not go down well here. Why have monarchies in Europe in 2017 ? We have politicians and diplomats? The royal houses have become an anachronism. No difference to be royal or celebrities, everyone can be HRH Princess now a days. Both work with charity - and appear in the same design brands. But they will be missed in magazines or on the internet /blogs (by us ;-) :-) :-) ! I wish them all the best! It is 2017! He deserves to be happy! Let them be happy! I personally think they would do some wonderful good in the world. Being 5th in line gives him the ability to step into the bigger world and do some good...ala his Mother's passions. Pretty sure the Queen has given her blessings. It is the first real deep relationship for him and at his age he knows what he wants. If she was white British and a socialite everyone would be thrilled. She is biracial, educated, wordly and far more sophisticated and better match for him than those wispy blondes w "pedigree". Chelsey was a great girl ....it was a great first love but she always said NO WAY to that lifestyle. I say leave them alone! I am very happy he seems to have found a mate that makes him smile so much! Seems like a good two cents, Diane. For me, the best argument for supporting this relationship is how happy, confident and grounded Harry has seemed since they have been together. I noticed it even before they came out publicly as a couple last year. I completely agree with Diane. As has been proven in the past, "scripting" a bride for members of the royal family is a very bad idea. Can't agree more with you Diane. You got a very cute dog!! Keep well..
Agree with you Diane. I think Harry needs somebody who is familiar enough with publicity to manage and Megan seems to be that. I think they have big changes to make it work together. Harry looks out happier and more beacefull than before, that is good. All the best to them both. I'd actually say the opposite. Meghan has been quite discreet. She has given no interviews about Harry. She closed down her blog. She severed relations with the Department store in Canada. She has gone about her job, which is acting. The only pictures of the couple together have been paparazzi shots of them walking to a play in London; attending friends' weddings and a polo match; and now walking across an airport runway. Diane the picture of your profile...is it your dog? bit late at night for me it looks like a dog can't enlarge it!! LOL no Anna-Marie it is a little witch on a broom 🤣😂 flying in the moonlight hahaaa! I thought it was cute. Looks much like the design logo for a very old show called Bewitched that I loved as a child back in the ....cough...60s. You have been reading too many tabloids, most British people will be happy if Harry is happy. She actually has a lot more going for her regarding accomplishments and work ethic than Kate did, or even the so called 'blood princess's' Bea and Genie. She seems like a hard worker and will be happy to put in the public hours, unlike some others who regard it as a chore. My worry is that she won't take well to the stuffy Royal system, if they start laying down the law and digging in the knife I can see Harry turning his back on the lot of them, all he needs is an excuse and he will be off to Africa full time with or without Meghan in the long term. Emerald city. How do you know that the most British people will be happy if Harry is happy? I say good luck to them, but I never see him relinquishing his role. He may love Africa, but I don't see him and his wife living there. Doing what exactly. Once you get used to living a lavish lifestyle and being influential, it would be difficult being obscure. As for the tabloids, they have the highest circulation and the comments about the relationship are not very complimentary. I simply wish Prince Harry every happiness and if this young lady makes Prince Harry happy, I hope marriage is in their future. I still remember that sweet heartbroken boy walking behind his mother's coffin. If she likes media attention it is a good thing, because she will have to endure it for the rest of her life if she marries prince Harry! ik hoop dat ze heel gelukkig worden, ik hoop dat ze goed om kan gaan met de pers !!!! maar ze zijn samen heel gelukkig! !prins albert zegt gewoon door gaan met je leven !! This may seem politically incorrect but here goes: The royals enjoy the privilege of their position because of their separateness from us. If they are just like us, then what sets them apart from the common people or even celebrities? I don't want a royal Duchess who can be seen acting the way Meghan's character does in Suits!! What happened to royal ladies being refined, ladylike and discreet in every way? It's one of the reasons I think Duchess Kate is wonderful - she is all those things. Prince Harry is still very close to the throne and should choose a bride who could become a Queen.Prince Harry should not expect all the perks of royalty without the responsibilities too. I'm not impressed by money, social status or jobtitle. I'm impressed by the way someone treats other human beeings. Have seen no evidence that Harry expects the perks of royalty without the responsibility. He is deeply and actively involved in charity work and his slightly more distanced position from thecthrone allows him a little more liberty in what he can say and do. Good luck go them. Alison, please consider that, in Suits, Meghan was doing her job, which is acting according to the writers' scripts. The writers and directors control the actors. It was a role she was hired to perform. Her personal life seems to have consisted of one very long-term relationship that started when she was quite young (similar to Harry's with Chelsy) and a relatively brief marriage. This was followed by dating a chef (also brief, similar to Harry's brief flings) and then she met Harry. Of course I understand that she was playing a character in suits.... It's just that all those steamy performances are available forever and ever and ever in cyberspace....and divorced too! Waaaaaay too much daylight let in on the majesty. There has to be a little aura of mystery, a little other-worldliness to royals otherwise, what is the point? Remember what happened the last time a girl described at "a breath of fresh air" married into the royal family? It all ended in toe-sucking and other embarrassments. No, I am sure Meghan is a lovely woman, but she is not, in my humble opinion, Princess material.... surely Prince Harry can find ONE lovely young English girl who is fresh and unspoiled? Really, not even ONE? Sarah Ferguson was an English girl. Diana Spencer was an English girl--fresh and unspoiled when she married Charles by all accounts. Disaster and heartache ensued. I just don't think the "English girl" qualification is valid. Which have been the most successful Windsor marriages? Victoria and Albert (he was German); Elizabeth and Philip (he was Danish, German-- born in Greece); Edward and Sophie (she is English); Richard Gloucester and Brigette (she was Danish); Peter Philips and Autumn (she was Canadian); Duke of Kent and Sylvana Thomaselli (Italian-Canadian). Another sad end: Princess Anne and English Mr. Philips--divorced. William and English Catherine--so far so good. Overall, being English is far from a magic recipe. What dynastic issues are at stake? Harry is 5th in line - unless there's an absolute disaster the Windsor dynasty will continue just fine without Harry's marriage (to whoever) making the slightest difference. Times move on - Queen Mary can carry on rolling in her grave, she's been there for ages and the world is a different place. The Queen had seen what "suitable" marriages have wrought in her family and is happy to allow Harry to choose his own future. And as for fresh and unspoiled? Personally, I find the suggestion that Meghan is the opposite quite insulting? She's a person, not something that's been used. Why specifically English? Is there something wrong with the other three countries in the UK? Franny - I was using "English" as a description of a British girl - forgive me but in my country it is how describe the people of the UK.... As the Great-granddaughter of a Scotswoman, I assure you I hold all the peoples of the British Isles in the highest esteem. It is apparent that many of you don't mind Prince Harry marrying just anyone, but I feel the burden of history bearing down on this situation, but hey-ho that's my problem, isn't it? Swedish Sofia was 'acting' in a soap-opera, her less dressed photos can be seen on the internet and nobody really knows what she was doing in New York but she is now looked upon as a perfect Princess. I am sure if Meghan is given the chance she will be a great bride and wife to Prince Harry. I wish them happiness. I'm not sure if Meghan's comfort or experience with the media is a good thing. I just don't wish for another Fergie, who just couldn't get enough attention, despite the embarrassment she caused herself and the royal family. There isn't a sure test for how one will behave unless he/she is thrown in the spotlight. Fergie was so prim and proper during her engagement interview. She moved in the same circles as the royals before her marriage-then disaster. Heart warming to see Prince Harry so happy ! I hope she says yes ! From what we know, she sounds ideal for him ! I'm sure everyone in Harry's circle will do everything they can to welcome Meghan into the family ! You can't help but want to wish them both every happiness ! It is just my gut feeling, from what I have observed anyway, that Meghan gives Harry the emotional support and confidence he needs -- something his former girlfriends weren't really able to do. And Meghan has certainly been discreet -- never talking about him in interviews, closing down her blog, etc. And she has the experience and polish for a life in the scrutiny of the public eye. She's bright and has accompanied much on her OWN. Also, she is a university graduate. Even before she met Harry, she was involved in international humanitarian works. So whatever will be for them, I wish them the very best. Agree on these points, Beverly. Good point, Franny. I think information with the photos said that they landed in South Africa. But who can really tell from that one pic of them walking across a runway? Maybe the journalists don't know where they went from there so all they can say is Africa. haar oma is zwart, ik weet niet of dat past in de stamboom. You mean, you don't know, whether Harry fits in Meghans family tree? Or what do you want to tell us with this comment? In this day and age NOBODY is going to complain about Megan's racial heritage unless they want to be called racist and rightly so. Prince Harry wouldn't be he first European royal to marry a person with African heritage and he wouldn't be the highest ranked either. Princess Angela of Liechtenstein has African heritage and is married to the second son of the reigning prince of Liechtenstein. Diane you nail it with this comment. Congratulations. If Prince Harry and Meghan love each other so be it.